If you're asking yourself, what is the one kitchen accessory I should pick up this summer, the answer should be a large wooden board or server. I have 3 (if you count my pizza paddle, which I totally do) in various sizes and pulling one out and piling colorful produce up alongside some crackers and yummy cheese is the easiest entertaining hack ever. 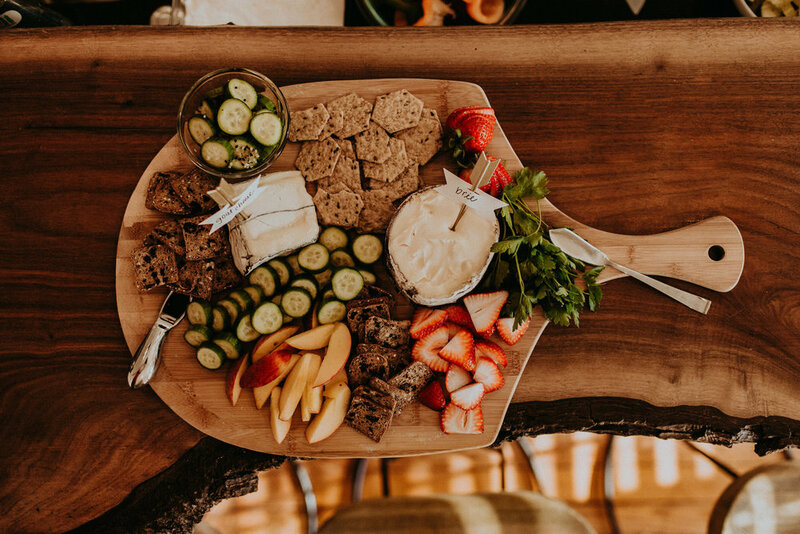 The wooden board instantly makes your spread look that much more put together and hello, cheese! A few weeks ago, my girl Sando and I threw together a little backyard dinner party to celebrate the early days of summer (see her preview post here) and this was our starter. We were still throwing together the main dishes as folks started to show up but no one seemed to mind as they dug into this summer cheeseboard. If I were going to add another cheese to this mix, I'd probably add something harder and sharper like an aged cheddar, Comte or Manchego. As summer continues, mix up the produce with whatever looks best at the market. Try some cherry tomatoes, melon or different kind of stone fruit. Sando and I will be sharing the full spread over the next little bit. Sando will be posting the recipes for the gyro flatbreads and shrimp pasta salad as well as some tips for setting an easy summer table over at TheDailyDeelight.com. I've still got recipes for watermelon gazpacho and skillet s'mores coming your way too!